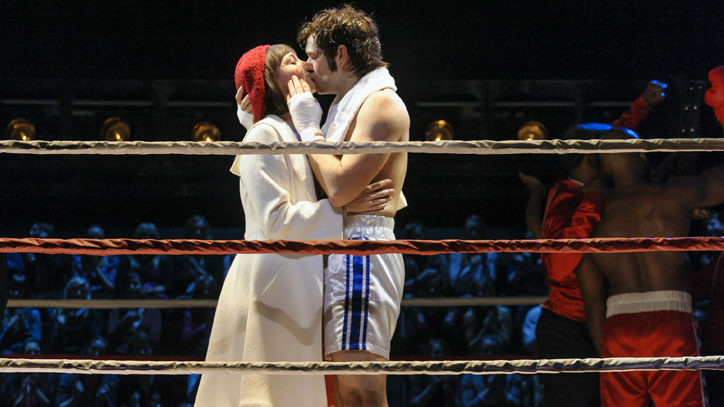 Rocky, the new stage production based on the Academy Award–winning Best Picture, arrives on Broadway in February. The story of a struggling Philadelphia boxer who finds love and dignity against all odds was written originally for the screen by Sylvester Stallone, who also played the title role in the movie. The stage version has impressive Broadway credentials: a book by Thomas Meehan, music by Stephen Flaherty, and lyrics by Lynn Ahrens. Meehan received Tony Awards for Annie, The Producers, and Hairspray; Ahrens and Flaherty won Tony and Drama Desk Awards for Ragtime. This month (September 26–28), the songwriting duo are celebrating their three-decade-long career at Manhattan’s chic cabaret space 54 Below with a series of performances that pays tribute to their wide range of work, which includes Once on This Island, Dessa Rose, My Favorite Year, Lucky Stiff, The Glorious Ones, and Seussical. We spoke with Ahrens and Flaherty recently about their long collaboration and their upcoming Broadway show, Rocky. Let’s start with your new musical, Rocky. How did it come about? Flaherty: Actually, when we presented the very first Rocky songs to him, he was filming Rocky Balboa in Philadelphia, so we were actually presenting to the man who was back in the world of Rocky. What was your first response when they asked you to write Rocky? Ahrens: In my case — and Stephen’s as well — it was, “How could that possibly be a musical?” Everybody thinks that. But that’s because people think boxing, when in fact the real key is that it is a romance first. This is the first truly romantic story that I have ever written. All of our shows have a love interest, but this is about a man and a woman who are on the brink of their last chance in life for love; they elevate one another and give each other a sense of self-worth. I couldn’t image how I would write this show until I looked at the movie again and read the screenplay, which is a beautiful piece of writing. It is such a gorgeous story, so moving and so honest, and that’s why we are doing it. Flaherty: I responded to the musical idea of it. Some of the scenes are really brutal and you can have this hard-hitting, rock-based score, and then some of the scenes are so fragile and so poetic. There is a sense of intimacy and yet a sense of spectacle and scale. This is really the first rock ’n’ roll score that I had ever done. Also, it is set in Philadelphia 1975–1976, and I grew up in Pittsburgh in that same time period. So I really relate to these people. Out of everything that I have written musically, I think that this is actually the closest to who I am. In my heart I was sort of writing it for my neighborhood. I just wanted to be very honest and very real, and emotionally direct, so any time it got musically too fancy, I would crumple up the paper. How do you both feel about boxing? Ahrens: Well, the first words out of my mouth were, “I hate boxing, I just have no connection to it!” But in the course of falling in love with the characters and realizing the potential it had to be a gorgeous story, I started researching boxing. So I started learning all the words and the terminology. A tomato can, for example, is a boxer who is a kind of punching bag for better boxers; he gets in the ring, gets all bloodied up, and he takes his pay and goes home. It has its own poetry. Then I read Joyce Carol Oates’s book called On Boxing and I fell in love with the world. I could see it from a completely different point of view as a woman — the art of it, the pain of it. Now does that mean that I enjoy watching them punch each other for real? No. But on the stage it is amazing. What the choreographers [Kelly Devine and Steven Hoggett] have created is quite unusual. Flaherty: When you think about it, the 11 o’clock number of Rocky is that fight. Steven, the fight choreographer, is so sensitive to music, it is terrific. There is something really brutal, so lifelike, and so incredibly poetic as well. It is staging and movement and video and everything that you have heard in the show somehow colliding. Working with him and Alex [Timbers, the director] to create that was really thrilling. The characters in Rocky are not particularly articulate, are they? Ahrens: Right, but that’s fun. It’s a challenge, but lyrics are essentially poetry set to music. It is wonderful to find their poetry. They use simple words, they don’t have a fancy vocabulary, and yet there is something so primal about the way they express themselves that it lends itself to music. Just as an example, the character Mickey, who is the old grizzled boxer who runs the gym and wants very much to train Rocky: he is 76 years old and he has been mean to Rocky for years, so Rocky doesn’t want to deal with him. We have a song for him called “In the Ring,” which tells of his life in boxing. I just love the lyric to that song because it is poetic and yet it is grounded in the dark realities of the world of boxing: “They fought us like dogs in the boxcars at night and paid us in apples and booze.” That kind of language and imagery is very rich. Flaherty: That particular song — I think it is an amazing song for an older actor — is all about manipulation because Mickey really wants to be the manager of Rocky and the whole song is sung to achieve that. Are we going to hear the famous Rocky theme music in your score? Flaherty: The minute you hear Bill Conti’s brass keys — I think that is in the DNA, not only of the character but in the mythology of Rocky, and to deny that it exists would be crazy. So I began to think of creative and exciting ways to weave it in and out of the score. Sometimes you just hear a rhythm, a harmonic progression. And, of course, we use it in surprising ways, I think. That’s the thing about Rocky: the people who love the film are expecting certain scenes to be on the stage, and for the people who don’t know the film, you have to be very clear. But we are taking a wonderful film and reimagining it for the theatre, and every moment has to be theatrical. You have to deliver and you have to stay ahead of the audience. So in every department we have really tried to make surprising choices. Ahrens: Because we are dealing with a famous movie we have used the iconic moments, but we use them in unusual ways. It is kind of homage and still fresh. Congratulations, by the way, on your 30th anniversary! How did you two meet? Ahrens: We met at the BMI Musical Theater Workshop. It is really interesting to look back because we have had all these years of adventure — not just writing shows, but traveling, working abroad, Hollywood — and it has been fantastic. Flaherty: I think I was maybe the luckiest composer ever because I met Lynn within a month of moving to New York in September of 1982, and within six months we began writing our first song together. Our methods were very different: I was this classically trained guy and Lynn was very in-the-moment. Since one of you writes the music and the other the lyrics, how does the work come together? Flaherty: Whenever I would write a lyric myself it would take me 30 words to get the idea across, but Lynn has a real spark. She could do it with five perfectly chosen words. Ahrens: Aww! I could write a terrific melody with four chords because of my whole background as a self-taught musician, but, you know, when Stephen Flaherty puts his hands on the keys, something else happens that is so sophisticated, so beautiful, and so soulful. So I just gave up writing music. I surrendered to him. I do have some musical input and he has tons of lyrical input, but we just enjoy what the other does. Flaherty: Oftentimes we work in the same room at the same time, trying to find a song, trying to find the emotion, the center of what it is about. I will come up with the idea of a musical feeling for a moment, and it usually comes from the characters’ emotional response in a very specific scene. And then Lynn will take that idea and build upon that. But oftentimes she will come up with a perfect lyric — like the song “Back to Before” from Ragtime. That was lyrics first, and not a single word changed. Ahrens: We try very hard never to repeat the same kind of project. Every project is set in a different place, it’s a different story, has different themes. We also try to make a point of working a little bit differently each time. A few times I have thrown lyrics at Stephen and he throws music at me. So it really is very flexible and unpredictable. Flaherty: It is a marriage, and the interesting thing is that you have to keep in mind that you develop as individuals but you also develop as the team. When we first met I had just come out of college and had a beard and my writing was very serious; Lynn said, “Let’s do a comedy!” I needed to lighten up and be more playful in the way that I worked. Ahrens: I think that I helped him to loosen up, but on the other hand, he had a vast knowledge of musical theatre and I did not. He knew about technique and how shows were constructed. Flaherty: The whole idea of collaboration is about the synergy — what I bring, what Lynn brings, how those ideas meet — and hopefully at the end of the day it takes you to a place that you wouldn’t have arrived at if it were just you.